Several years ago, while I was going through a stressful time watching my beautiful mother decline, my sister-in-law gave me a mug with a quote from Eleanor Roosevelt scrolled across the porcelain. 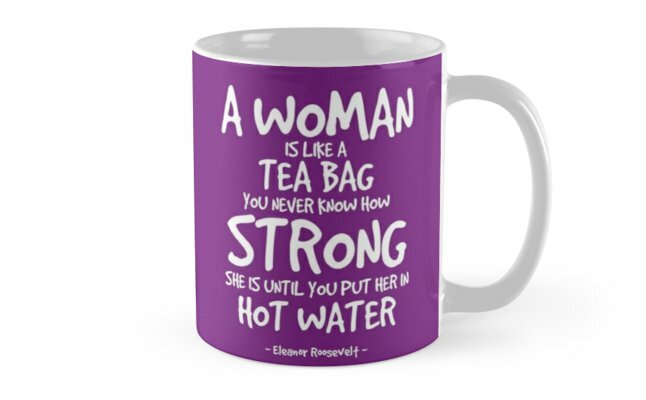 "A woman is like a tea bag - you never know how strong she is until you put her in hot water." How perfect! Read those words again. I'll bet you'll come up with a time when you were in the so-called hot water and garnered your own strength. Not only do I appreciate the former First Lady's wisdom, I feel as if she's been a part of my life. No, I never had the honor of meeting her, but my mother did. I remember how excited Mom was, practically dancing her way out to the car the morning she was to pick up Eleanor Roosevelt at La Guardia airport. Just so you know, my mother was not the world's best driver by any stretch of the imagination, but that didn't matter to the teachers and staff at Harriet Beecher Stowe Junior High School in Harlem. Mrs. Roosevelt was coming to speak with the students, all girls back then in the late 1950s, and my generous mother, a permanent substitute at 136 (which she always called the school, probably because it was on 136th Street in Harlem) offered to be the former First Lady's chauffeur. I heard about that story for years and wish I could ask my mother now more about the conversation they had as they sat in the Buick driving through traffic on the Cross Bronx Expressway. I'm sure it was fascinating. My brother-in-law, Sidney, also met Mrs. R., around the same time as my mother. As a student at Seth Low Jr. High School in Brooklyn, he and his friend, Marvin, interviewed her for their school newspaper. Years later, for his 50th birthday, Marvin gave Sid a coffee mug (is there a theme here with mugs and Eleanor?) with a picture of the three of them printed on it. Marvin had saved the picture taken that day, most likely with a Brownie Hawk-eye, for thirty-five years! I don't know where that mug is now. I hope Marvin has it. The two boys were beaming in the photo, and at the birthday party, too, all those years later when they reminisced. So why am I focused on this impressive woman who was not only First Lady but also served as U.S. Delegate to the United Nations General Assembly from 1945-52, chaired JFK's Presidential Commission on the Status of Women, and did so much for human rights? Because, again, she's been a part of my life. This time, I've spent days with her while I devoured B.A. Shapiro's historical fiction page-turner, The Muralist. 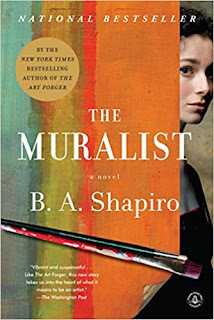 Shapiro's characters are so alive on the page that I feel I know them and wish I could call Jackson Pollock, Lee Krasner, and Mark Rothko, as well as Mrs. Roosevelt, to let them know what happened to their fictitious friend, Alizée Benoit. Even after finishing the book, I have to remind myself that Alizée wasn't real. Alizée was definitely like a tea bag. She not only found herself in hot water, hers was boiling, steaming, hotter than molten lava and her strength soared. I highly recommend this book. Take the thrilling ride, back and forth, from New York City today to the NYC of the 1940s with its art world and the emergence of the Abstract Expressionists, across the ocean to German Occupied France where Alizée's family struggled to save themselves from the Nazis. And remember, this is a work of fiction, though you'll think it isn't. Find out what happened to Alizée when she went missing. I just love this Blog entry! I had no idea that your mother, (my second mother on Edward St.) met Eleanor Roosevelt and because I had known your mother so well, I know that their time together in the "Buick" must have been an extraordinary experience for her. Will put it on my list, LInda. Thanks for the rec.